Want to be amongst the first in the UK to get your hands on the DollyCrane? Well, you can, but you will have to be quick. Our demo DollyCrane is currently taking pride of place in our Pinewood Offices (that actually means it’s taking up most of the space in the middle of one room…) whilst we test some gear with it, and get it ready for demos, reviews and the first UK shoot next week. We’ve lined up demos with the new RED Epic, details of which will be posted here, and several reviews with the leading UK equipment magazines. Links and details will be posted here too. We will also be hosting some regional Floatcam demo days for those of you who aren’t near London. Details and dates TBC but will most likely be Pinewood Studios, Manchester and Glasgow. In addition to the DollyCrane we will have several of the Floatcam stabilisers on show too. Check back here or subscribe to our blog (at the bottom of the page) for more details. It’s here! Floatcam DollyCrane hire! 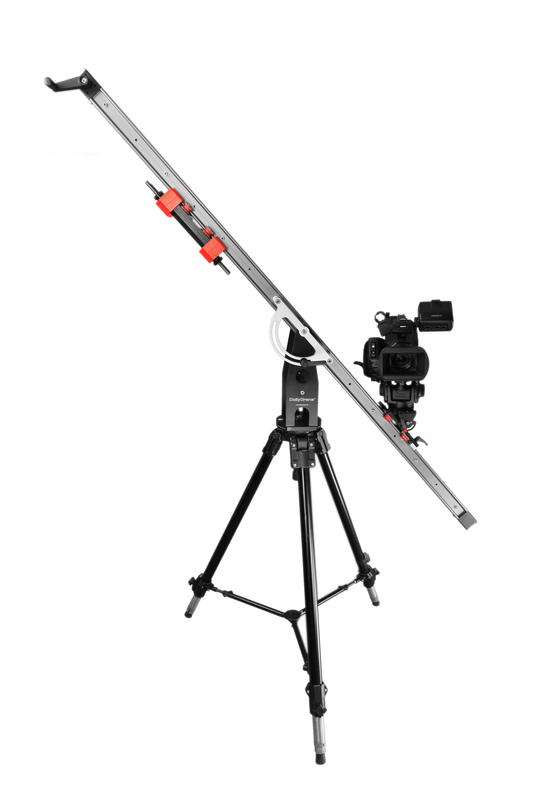 Hire our award winning DollyCrane complete with MN528XB heavy duty tripod and fluid head from just £130 a day!. Enhance your shoot with tracking moves simply not possible with a dolly or any other slider! The DollyCrane is the ideal grip solution for corporates, virals, promos, ENG and EFP shoots where space and budget are at a premium. It will take up to a 10kg camera (depending on head), so is ideal for everything from a Z1 or a DSLR, all the way up to a full size HDcam, Digibeta or RED camera. It can be quickly and easily set up and operated by one person, and is supplied in 3 soft cases that will fit in the back of almost any estate car. All rates are ex vat. Subject to availability and hire terms. Please ask for more details. The Floatcam Dolly/Crane is now available for demo! The new Dolly/Crane from Floatcam will be available for demos at our Pinewood Studios offices from the 18th May! Demo’s are by appointment only, and slots are filling up fast. You can bring your own camera kit for the demo if you would prefer, or we can demo it with a range of small, medium and full size cameras (up to 10kg). Get in touch for more details or to book your demo.